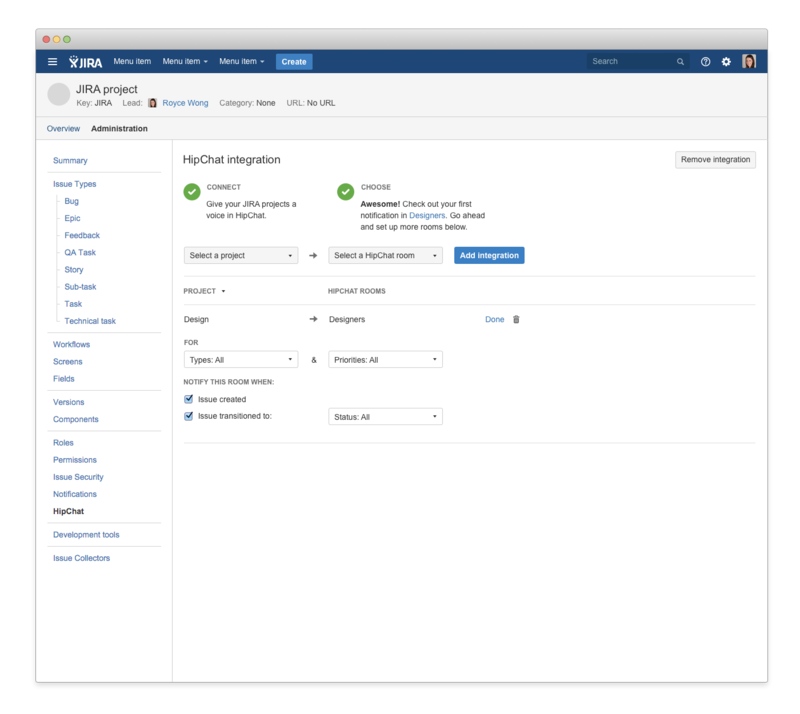 JIRA and HipChat integration has been reworked to improve the initial configuration, remove the need to edit project workflows and to improve the customization capabilities of linking projects to specific rooms. Improved integration - Initial integration has been improved with a simple to use configuration wizard that removes the need for obtaining and entering tokens significantly reducing the time it takes to link JIRA and HipChat. More refined room linking - Notifications can now be created and linked to rooms with the actions you want. Link individual projects to rooms and set notifications to be sent when an issue is created or changes status. In addition, you can configure notifications to be sent based on issue type and priority. Improved notifications - Notifications have been redesigned to allow you to quickly view your important issue information quickly without disrupting your workflow in HipChat. You can now base your swimlanes on epics in Kanban boards (already available for Scrum boards). This makes it much easier for you to track the progress of epics. Every epic that has issues is shown as a swimlane on the Work mode of a board. Note, JIRA Agile 6.6.51 and JIRA Agile 6.6.50 are functionally the same: 6.6.50 was only released to JIRA Cloud and 6.6.51 was only released for JIRA Server.